The NRP Public Consultation and Consensus Gathering for Block 130-146 Choa Chu Kang Ave 1/Teck Whye Lane/Teck Whye Ave were held in 6 September 2014 and 6 June 2015 respectively. The NRP was supposed to start in the first quarter of 2016 but was subsequently postponed to the second quarter. However, the NRP has not started till date. I would like to ask Chua Chu Kang Town Council about the confirmed start date of the NRP; the residents are looking forward to knowing the details and timeline for the NRP. The Town Council would first like to thank Mr Loong for his feedback, and apologise for any inconvenience in which he may have experienced. It is the Town Council’s aim to provide facilities that meet the needs and interests of residents. Towards this objective, we take into account residents’ feedback in formulating our development. We will then work with the authorities to develop the details and award tenders with care before commencing actual construction work to ensure that the standard of upgrading works will not be compromised. There was a delay in the Neighbourhood Renewal Programme mentioned by Mr Loong due to a revision in the upgrading plans required by the authorities. Mr Loong and residents would be pleased to know that we have since finalised the plans and preliminary work is expected to commence in the last quarter of this year. However, the major works will commence after the Chinese New Year period to minimise inconveniences to our residents during the festive seasons. We will continue to actively monitor the progress of the upgrading works and keep residents informed of the latest updates. SINGAPORE – The town council is well aware of the above mentioned situation that has been publicized on several media publications such as Lianhe Wanbao (28 June 2016), The New Paper and The Straits Times (29 June 2016). The town council has had our conservancy staff deployed to this estate in late March 2016. When the issue of the choked chute emerged, the town council had conservancy workers actively deployed daily to manually remove the waste found around the common areas. Noting the overwhelming amount of renovation waste generated, our conservancy contractor had increased the number of workers cleaning the area as well. Investigations revealed that the Refuse Handling Equipment (RHE), which is part of the Central Refuse Chute located on the ground floor, had malfunctioned due to the improper disposal of bulky refuse and renovation debris into the chute. As of 27 June 2016, we understand that the choke had been cleared, and the proper functioning of the RHE restored. 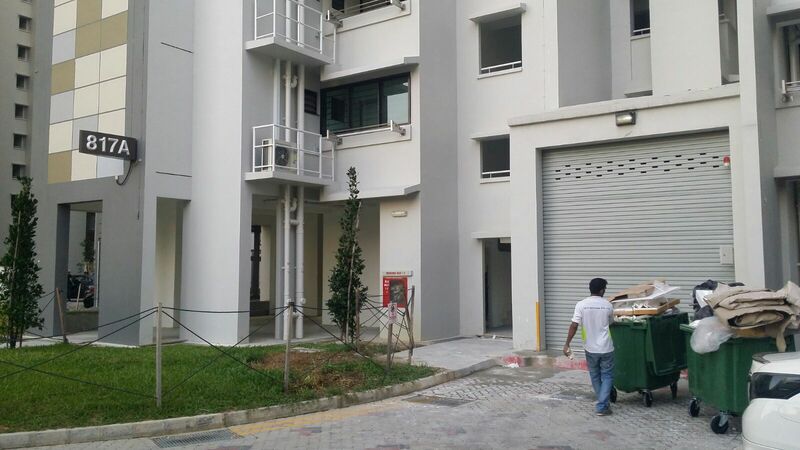 Earlier this year, prior to the completion of the new HDB blocks, the town council had notices prepped and put up around the estate, urging contractors to arrange for the disposal of their own renovation debris. Residents were also encouraged to inform the town council should they witness any illegal dumping activities taking place. As of now, preventive measures are being mapped out to prevent and/or minimize repeat occurrences. These include the installation of CCTV at key areas whereby dumping is rampant, deployment and stationing of town council officers at the Building Services Centres, and stepping up on enforcement to catch errant contractors. As there are many renovation works still being carried out, the town council would like to continue to reach out to all residents to report any case of indiscriminate dumping and misuse of the refuse hoppers to the town council. They may do so by calling 6569 0388 or emailing info@ccktc.org.sg. SINGAPORE – Around 840,000 HDB households can expect to receive $86 million worth of Service & Conservancy Charges (S&CC) rebates, the Ministry of Finance said on Friday (April 29). 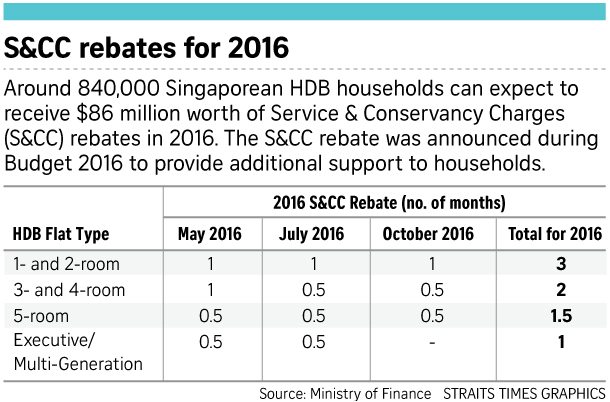 In total, each eligible Singaporean household will receive one to three months of S&CC rebate, depending on their HDB flat type. Eligible households would have received a letter in April with more details of the S&CC rebate. The rebate was announced during Budget 2016 to provide additional support to households. It will be used to offset a household’s S&CC payment directly. For households who pay their S&CC through Giro, their town councils will arrange with the banks on the S&CC payments to take the rebates into account. For enquiries on their S&CC payment and account status, residents can contact their respective town councils. They can also call 1800-866-3078 (Mondays to Fridays, 8.30am to 5pm) or e-mail sccrebates@mailbox.hdb.gov.sg to check on their household’s S&CC rebate eligibility. SINGAPORE: From June 1, smoking will be banned at reservoirs and more than 400 parks islandwide, Senior Minister of State for the Environment and Water Resources Amy Khor announced in Parliament on Tuesday (April 12). 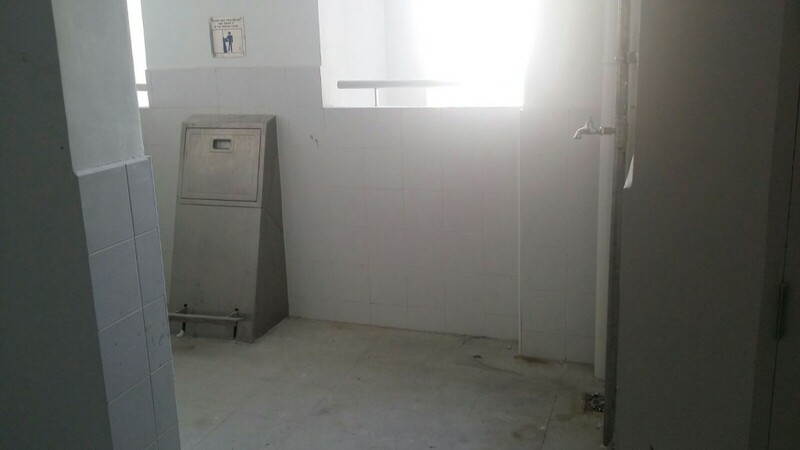 The owners of these premises will have the option to set up designated smoking points and will be responsible for their maintenance, said the Ministry of Environment and Water Resources (MEWR). For the first three months of implementation, those caught smoking in the newly prohibited places will receive a warning, to give the public time to adjust. But repeatedly flouting the law in spite of warnings can result in a fine of up to S$2,000. The National Environment Agency (NEA) said it will ensure that “No Smoking” signage is installed within the new premises, and that bins with ashtrays will be shifted or replaced with bins without ashtrays. It will also release educational outreach materials and activate volunteers to advise smokers on the new implementation. Additionally, Singapore Armed Forces (SAF) bases and camps, and the Ministry of Home Affairs (MHA) will be formally included under the Smoking (Prohibition in Certain Places) Act from June 1, said Dr Khor. Smoking has been prohibited on SAF camps and bases and MHA premises voluntarily since 1993 and 1998 respectively, although it is allowed at designated smoking points in these areas. NEA said the Government’s long-term goal is to prohibit smoking in all public areas to protect non-smokers from the harmful effects of second-hand smoke. “To protect non-smokers, we have progressively prohibited smoking in public places since the 1970s. The smoking prohibition was last extended in 2013, and today there are more than 32,000 premises and locations where smoking is prohibited,” said Dr Khor. In 2015, about 17,000 tickets were issued for smoking in prohibited areas, said NEA. Noting that cigarette butts are also one of the most common pieces of litter in Singapore, Dr Khor clarified that NEA’s Community Volunteers (CV) – who possess powers that NEA officers have in relation to environmental offences – will only be allowed to use their authority card to request for the particulars of a non-compliant offender. SINGAPORE: To make it more convenient for the public to reach the Municipal Services Office (MSO), a new crowdsourcing app feature along with a web portal are being introduced, said Minister of Culture, Community and Youth Grace Fu on Monday (April 11). Ms Fu heads the MSO, which works with Government agencies to improve feedback management for municipal services. She announced that MSO’s OneService mobile phone app will add a crowdsourcing feature to collect information that helps agencies address municipal issues for which users do not expect a reply. The feature will be piloted in a Spot Abandoned Trolleys initiative – operational by the end of April – which will see the MSO working with five supermarket chains (Cold Storage, Giant, Mustafa Shopping Centre, NTUC FairPrice and Sheng Siong) to help retrieve abandoned supermarket trolleys. “I am sure many of us have encountered the odd supermarket trolley at void decks or walkways, which caused obstruction or was being used as a litter dump,” said Ms Fu. “So when you next see an abandoned trolley, simply use the OneService app to submit its location. We will pump the data to the supermarkets which will go round to collect them periodically. “If the Spot Abandoned Trolleys initiative works well, we will look at expanding crowdsourcing arrangements to other municipal issues,” she added. 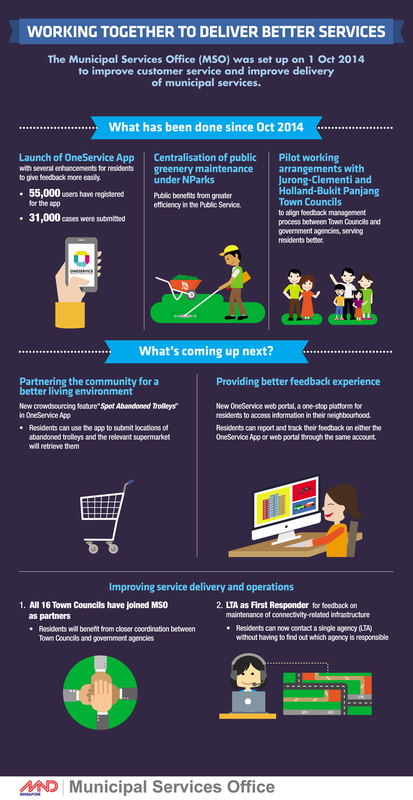 On top of the app, MSO will launch the OneService web portal this year, which gathers relevant information from partner agencies that affects specific neighbourhoods – such as dengue clusters, HDB block-cleaning schedules, and traffic incidents. In her Committee of Supply speech to Parliament, Ms Fu also announced that LTA will be the first responder for feedback on maintenance of connectivity-related infrastructure such as cycling paths, ramps, staircases, overhead bridges and lifts, promenades and pedestrianised streets. 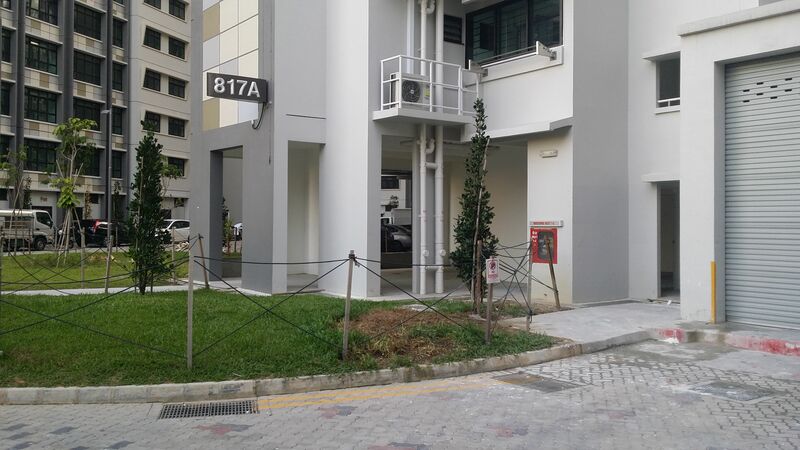 “What this means is that if you see a damaged footpath or sheltered linkway, and are unsure of whom to contact, you can use the OneService app, which will route such cases to LTA to assess and lead in the response,” said Ms Fu. Additionally, all 16 Town Councils in Singapore have agreed to collaborate with MSO after the success of pilot partnerships with Jurong-Clementi and Holland-Bukit Panjang Town Councils, said Ms Fu. The other Town Councils will now be progressively brought on-board from April to the fourth quarter of the year. Singapore, 13 February 2016 – Mr Zaqy Mohamad, Adviser to Chua Chu Kang GRC GROs (Keat Hong), unveiled extensive plans to rejuvenate Keat Hong at the constituency’s Lunar New Year celebration dinner. The plans fall under the vision of KEAT HONG 2020 where the constituency will see a significant part of the estate revitalised over the next four years into a vibrant and contemporary residential hub, incorporating the latest facilities to encourage an active lifestyle. This is the first time the constituency has branded all these developments under one banner. Said Mr Zaqy Mohamad: “Keat Hong is a neighbourhood with a lot of history; where many residents have lived here for two generations or more. The estate, therefore, needs to be rejuvenated with the “hardware” component, while strengthening the community spirit with the “heartware” component. * “Heartware” will take the form of community initiatives by People’s Association and Grassroots Organisations to strengthen the community spirit in Keat Hong. * The upcoming five-storey Community Club @ Keat Hong, located opposite Lot One Shoppers’ Mall, will be the first Community Club in Singapore to have an 18-lane bowling centre as well as a ceiling to floor LED wall located at the centre of the plaza where residents will be able to enjoy movie screenings and possibly, ‘live’ sports matches in future. Residents can also look forward to the family-friendly 24-hour gym when it opens in December 2016. * Apart from this iconic lifestyle hub, together with People’s Association, the Grassroots Organisations will continue to serve the residents with initiatives which are tailor-made and catered for the different groups of residents. * “Hardware” consists of at least $50m worth of upgrading projects which will be undertaken by Chua Chu Kang Town Council, Housing and Development Board (HDB), Land Transport Authority (LTA), NParks and various agencies. 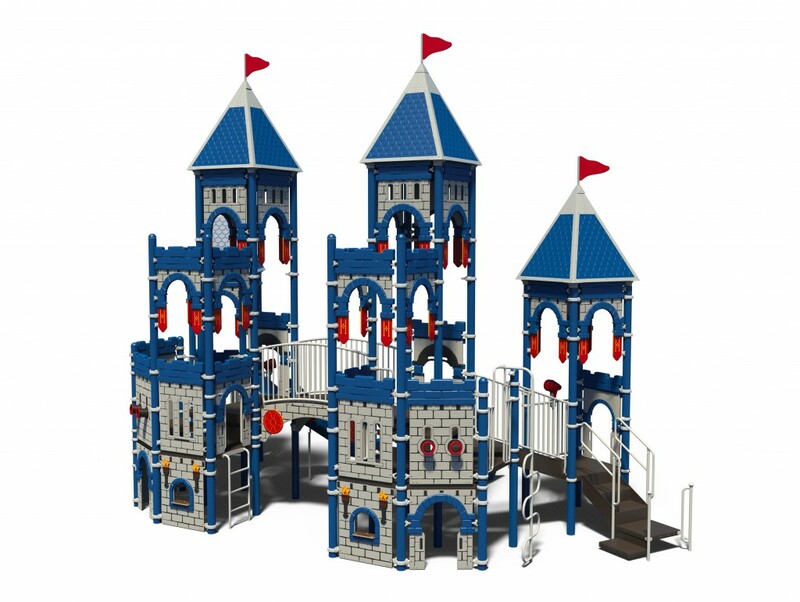 * Children in Keat Hong can look forward to Singapore’s first-ever “castle-themed” playground and an innovative new-concept cycling station called “Speed Racer” which uses human kinetic energy to power an electronic racing game board. * Under the NRP, Blocks 401 – 428 in Choa Chu Kang Ave 3/4 will see improvements to their common areas. The heart of the precinct will take on new life as a Mega Active Lifestyle Hub, consisting of a playground, fitness corners, and game courts suitable for residents of all ages. * Apart from the upcoming sharing sessions for this particular NRP which will kick start in April 2016, residents can also expect to receive similar invitations to attend sharing sessions or to provide their suggestions through surveys in the near future for various projects like Large-scale Town-wide and Repairs & Redecorations. * Mooted by Mr Zaqy Mohamad, residents can expect the traffic flow to improve with the stretch of Choa Chu Kang Ave 4, between Choa Chu Kang Loop and Choa Chu Kang Drive, to be widened by the second quarter of 2016. * Residents will also benefit from the phased implementation of sheltered linkways within 400m radius of the Choa Chu Kang MRT to major pathways. These will be implemented in phases, in tandem with the development of the new Community Club, road widening works as well as the bus interchange upgrade. In addition, there are other initiatives being planned under KEAT HONG 2020 and these will be revealed in due course. Singapore, 31 August 2015 – Plans are underway to further improve amenities and infrastructure in Chua Chu Kang for the next five years under the Chua Chu Kang GRC Master Plan. The Master Plan is part of an ongoing mission which has already seen various upgrading and development programmes in the constituency in the last five years. For example, at least 10,000 HDB residential units have already benefited from the Home Improvement Programme (HIP), Enhancement for Active Senior (EASE) Programme and Neighbourhood Renewal Programme (NRP). Chua Chu Kang GRC will be much better connected with new initiatives like Walk2Ride and intra-town cycling paths. Sheltered linkways will be constructed within a 200m radius of the LRT and a 400m radius of the MRT. There will be a comprehensive network of cycling paths, measuring approximately 6km in total, constructed to give residents easy access to the major transportation nodes, community places, shopping centres and park connectors. People’s Association has completed upgrading works for Chua Chu Kang, Nanyang, and Yew Tee Community Clubs; as well as the new Bukit Gombak and Keat Hong Community Clubs which will be completed in the near future. The upgraded and new Community Clubs will also offer venues for residents to bond, enjoy and participate in activities. The Home Improvement Programme (HIP) will continue, enhancing flats that were built before 1986; while the Neighbourhood Renewal Programmes (NRP) will benefit more than 10,000 household units. The Town Council will continue to improve the estate with new linkways, drop-off porches, fitness corners and playgrounds; as well as providing a variety of three-generation fitness facilities like jogging and cycling tracks, fitness corners and playgrounds. More parks will undergo improvement programmes and more leisure spaces will be created for our residents to relax, keep fit and healthy and appreciate nature. Understanding that connectivity is key to the success of a township development, LTA will embark on the Walk2Ride programme by constructing more sheltered linkways near transport nodes to ensure ease of access for commuters who walk to their rides. The programme will cover a 200m radius of the LRT and a 400m radius of the MRT. To further complement the public transport network and promote intra-town cycling, a comprehensive network of cycling paths, measuring approximately 6km, will be constructed. These cycling paths will give residents easy access to the major transportation nodes, community places, and shopping centres. Recreational cyclists will also be able to access the existing Park Connector Network that runs through their towns via these cycling paths. More bicycle racks will also be installed town-wide. We are currently in discussions with the Singapore Police Force to install the POL CAM (CCTV) in all void decks by 2016 for the security monitoring of bicycles racks. Residents can also look forward to new MRT stations at Ten Mile Junction and Hillview under Stage 2 of the Downtown Line which will commence operations on 27 December 2015. The Line will significantly improve connectivity for the community in the north-western region of Singapore and save travel time by up to 30%. LTA will also be reviewing the redevelopment plans for the town centre, which will include an assessment of the viability of developing Choa Chu Kang Bus Interchange into an integrated transport hub. Both the new Bukit Gombak Community Club at Hillview Avenue and the Keat Hong Community Club at Choa Chu Kang Avenue 4 are expected to be ready by 2016. With the new Community Clubs, more residents will be able to participate and enjoy in healthy activities with their families and friends. The Bukit Gombak Community Club will have eco-friendly features such as a vertical green wall, a community spice garden and irrigation with recycled rainwater. Keat Hong Community Club is pushing for a bowling facility to be constructed. Chua Chu Kang and Nanyang Community Clubs have been upgraded recently, offering more conducive environments for residents to mingle. Older housing estates need to be regularly rejuvenated to enhance their asset value. 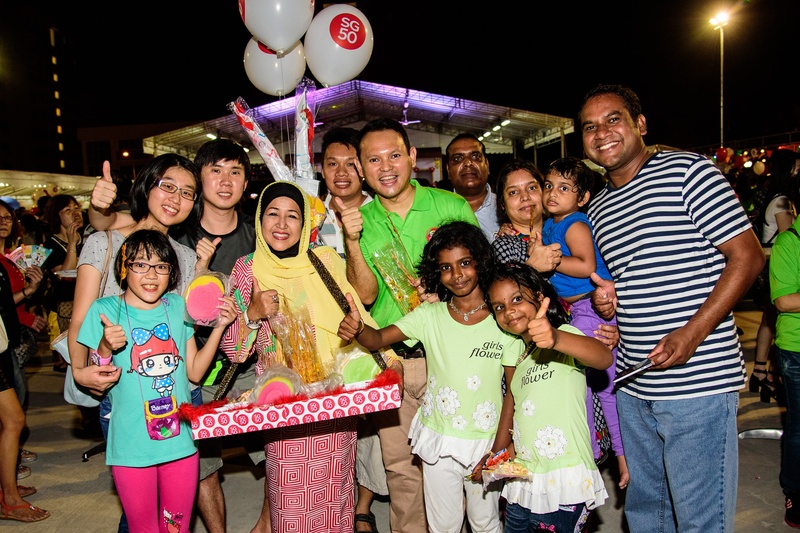 The upgrading of these neighbouhoods will be taken care of under the Home Improvement Programmes (HIP) and the Neighbourhood Renewal Programmes (NRP). The HIP will be launched at the following blocks, benefiting a total of 3,944 households. The NRP focuses on improvements to the common areas and actively engages residents in shaping their environment through public forums and consultations. NRP will be implemented at the following blocks, benefiting a total of 5,828 households. Lifts will also be constructed in 20 multi-storey carparks to allow for easier access. A total of 132 lifts will also be undergoing Selective Lift Replacement Programme in the next two years; with more lifts expected to qualify in the near future. The new lifts will come with better safety and security features, like vision panels and motion-sensing doors. Large-scale town-wide improvement projects will also be implemented in Keat Hong constituency, consisting of facilities like playgrounds, fitness corners, hardcourts, barbecue pits, pathways, and sheltered stages. A variety of fitness facilities, including jogging and cycling tracks, fitness corners and playgrounds will be built. 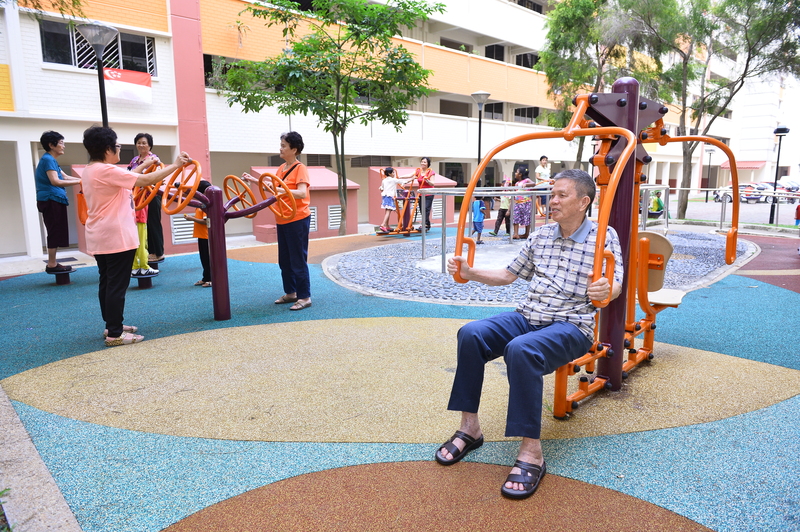 To encourage seniors to live an active lifestyle, we are also working with Sports Singapore and Ministry of Health to provide more equipment in our fitness corners for seniors. There will be a concerted effort to keep the living environment clean and green and to incorporate green spaces into the community. Choa Chu Kang Park underwent a major upgrade recently, and we will continue to implement park enhancements and create more leisure spaces where our residents can relax and appreciate nature. In a move towards eco solutions, the second batch of energy-saving LED lights will be installed by 2016. A total of seven solar voltaic panels have been installed in the estates, with another 40 blocks are in the pipeline. While Chua Chu Kang Town GRC has been working in consultation with the Ministry of National Development, various agencies and the grassroots leaders in drawing up the Master Plan, it also recognises that feedback from residents is an important component in the whole process before the Master Plan is finalized. As such, events will be organised in which the Master Plan will be open for public viewing and feedback obtained before any major decisions are taken. The Rodent Control Team which was set up by Chua Chu Kang Town Council uncovered nearly 1,000 rat burrows in the first 2 months. The pre-emptive programme saw success with the decrease of rat burrows to about 60 after 5 months into the programme. Chua Chu Kang Town Council Chairman, Mr Zaqy Mohamad, mentioned that the Town Council noticed the increase in rodent feedback since June 2014. As the rodent control had limited effect at that point of time, they decided to take pre-emptive measures to deal with the rodent situation before it could escalate into an infestation and affect the residents. Chua Chu Kang Town Council was the first Town Council to initiate a systematic, rodent-eradication programme with National Environment Agency. A dedicated, full-time rodent control team was tasked to search for rat burrows in the entire GRC; with the use of new equipment and methods, the team actively treated the burrows and eliminated the rats to prevent the situation from escalating. During the first 2 months of the programme, the team have uncovered and treated 904 rat burrows within the entire GRC. When January came, the numbers dropped to 500 rat burrows. In February and March, the numbers dropped to an average of about 60 rat burrows. Mr Zaqy Mohamad mentioned that it is difficult to predict the result at first as this is a new programme, however, the result shows that with the team’s cooperation and effort, the programme saw success with the drop in number of rats and relevant feedback. After the aggressive rat elimination phrase of the programme, the team will move on to the second phase, which is the continued monitoring and elimination of rats. The entire programme will last two years. Rats usually appear in places with food source and it is very difficult to eliminate them. Hence, public education is very important. Mr Zaqy Mohamad mentioned that the team noticed that the rats will normally appear at food centers, food courts, markets with food source. After treatment, the rodent problem comes back again repeatedly. The Town Council have since disseminated handouts that informed residents of the programme and remind them to keep their estates clean, citing examples of good waste disposal habits to deter breeding of rats. The Town Council also hopes that residents can promptly feedback any rat sightings so that the Town Council can act upon it swiftly. I have been living in Choa Chu Kang for nearly 20 years and other than for the application of GIRO services for my S&CC payments, I have never had to contact Hong Kah Town Council or Chua Chu Kang Town Council. Why? It is because there is no need for it. Whether it is the daily clearing of rubbish, monthly block washing or yearly clearing of bulky items, the Town Council have always been doing it properly. After the lift upgrading which lasted 4 years was completed last year in December, the Town Council upgraded the surrounding area as well. Before Chinese New Year, the senior citizen fitness corner and jogging track were completed. Other than this, the Town Council also installed the new stainless steel incense burners. However, an incense burner was placed too near the HDB flat as it was under the resident’s bedroom. Although the incense burner prevented ashes from flying, the heat and smell still affected the resident. After discussion with a few neighbours, I emailed Chua Chu Kang Town Council Chairman, Mr Zaqy Mohamad on their behalf to request for the relocation of the incense burner. I emailed Mr Zaqy on 16 Feb 2015 and received an automatic reply. I thought that the matter will not be resolved before Chinese New Year. However, I received Mr Zaqy’s reply an hour after I sent my email and was told that the property team will follow up with the matter. 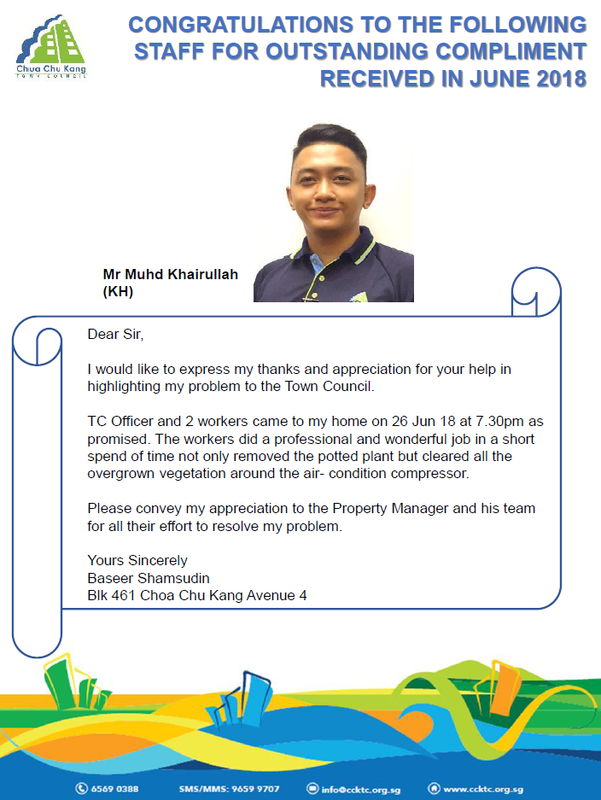 On 17 Feb 2015, I returned home to find that the Town Council had responded to our request by relocating the incense burner to a further location, in the middle of two HDB flats. This meant that the resident will no longer need to endure the heat and smell from the incense burner. 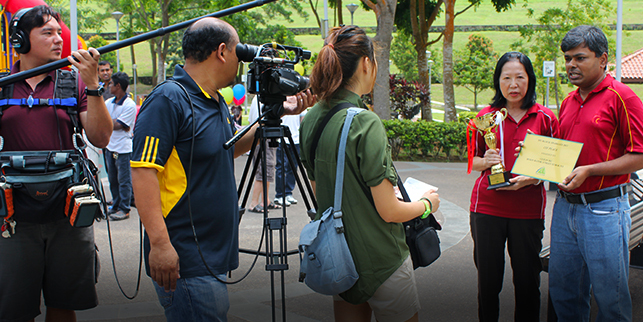 Chua Chu Kang Town Council handled the feedback in a short span of 24 hours. The affected residents were able to have a happy Chinese New Year while other residents were able to continue their religious practice of burning incense paper. The monthly S&CC of $55.50 is totally worth it. Reported that an elderly woman staying at Block 208 Choa Chu Kang Central has been leaving food remains under a tree daily. The food remains attract pigeons in the day and rats at night. The cleaner mentioned that an elderly woman staying on the 4th floor leaves food remains under the tree thrice daily. The food remains includes bread and rice. The food remains also create a stench and the cleaner has to clean it up. A resident mentioned that this problem has lasted for a few years already. Another resident mentioned that he did not notice the food remains under the tree but spotted rats in the estate. Chua Chu Kang Town Council highlighted that they are working with AVA and NEA on the matter and have started on a plan to eradicate rats in the estate since November 2014. The Town Council and AVA had also received feedback from residents regarding feeding of pigeons at Block 208 Choa Chu Kang Central in November 2014. Subsequently, the Town Council had issued notices to residents to refrain from feeding pigeons, eradicated the pigeons’ nests and cleaned up the food remains. As for the plan to eradicate rats in the estate, the first step will be to control the rats’ population in the estate. The second step will be the maintenance and educating residents on how to prevent breeding of rats. Since the start of the plan, the rat situation in Choa Chu Kang has improved. The Town Council will continue to work with NEA and AVA on this matter. Bulky, unwanted items strewn along the corridors of public housing estates is becoming a phenomenon that is on the rise, as many households spring clean for the year-end. SINGAPORE: Bulky, unwanted items strewn along the corridors of public housing estates are potential safety hazards. Yet, it is a phenomenon that is on the rise, as many households spring clean for the year-end. Holland-Bukit Panjang Town Council said requests for its bulky items removal service have increased by 15 per cent. However, despite this, bulky items such as old furniture can still be seen along the corridors of its public housing estates. In Woodlands, there are about 13 such cases on average each month. Town Council officers will usually notify residents to remove these items by a certain deadline through a formal letter and while most residents are cooperative, some do cause trouble for officers. Said Sembawang GRC MP Ellen Lee: “It is usually the older residents – those that have already made it a habit sometimes – that are harder to convince. Usually, when we know that this is a repeat offender, our officers will actually move in to try to persuade them, to educate them, and to involve the family members as well. Minister Gan Kim Yong attended the Anti-Bicycle Theft Initiatives event at Chua Chu Kang Community Club. Three key Anti-Bicycle Theft Initiatives were announced by the Singapore Police Force (SPF) and the National Crime Prevention Council (NCPC). The first initiative is a pilot of a new bicycle rack design, named Lock Lah, which improves on the security of old racks without high costs and space requirements. 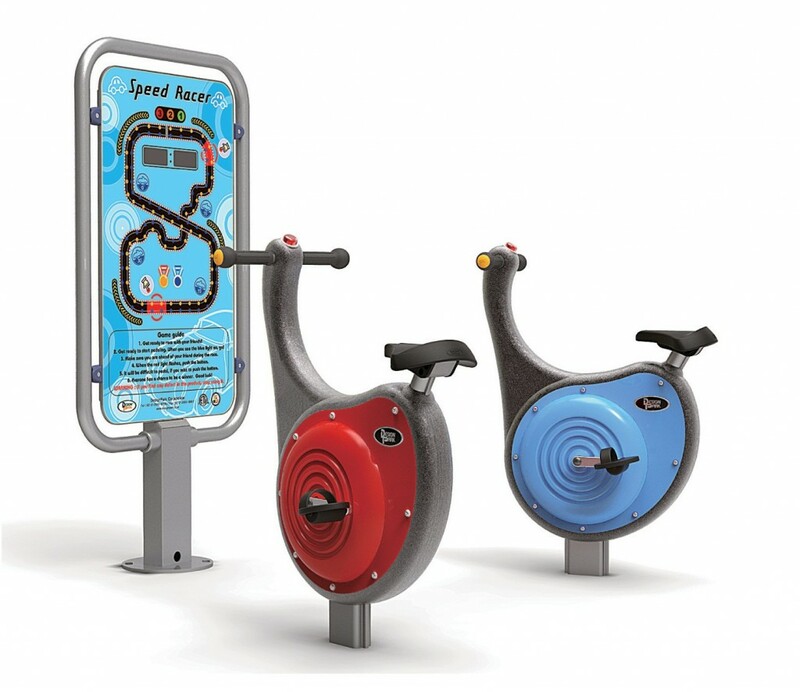 The second initiative is an enhanced bicycle labelling system. Finally, new anti-theft bicycle signage will be posted near bicycle racks across the island to increase awareness of bicycle theft. These measures are part of a continuous effort to tackle theft of bicycles. Though figures have fallen since last year – 588 cases were reported for the period of January to June this year, compared to 630 for the same period in 2013 – the Police say such theft remains a major concern. Town council officers will typically visit residents who default on payments to understand their predicament, before imposing a penalty fee on service and conservancy charges owed. SINGAPORE: At estates managed by People’s Action Party-run town councils, up to three monthly reminders will be sent to residents who have not paid their service and conservancy charges (S&CC). By the third month, most of the town councils will impose a penalty fee. Before the penalty fee is imposed though, town council officers will typically visit residents who default on payments to understand their predicament. Advice on financial schemes they can tap, such as ComCare or assistance in job matching, is then dispensed to those who need help. The Temporary Estate Inspector Scheme offered by the Northeast Central Development Council, for instance, hires unemployed residents who have difficulty paying S&CC as temporary inspectors to identify faulty lights or water leaks around the estate. The money which they earn from the scheme will be used to offset their arrears. Among the eight PAP town councils contacted by TODAY, four cited low-income families as the main source of residents with arrears. Bishan-Toa Payoh Town Council Chairman Hri Kumar said a “disproportionately large” number of families in arrears he encountered live in one- and two-room flats. “The failure to pay S&CC is sometimes a good indication of a deeper problem, and we have identified a number of needy families this way,” he said. Nevertheless, not all households with arrears are in financial hardship, the town councils noted. “Some are couples who are estranged or going through divorce and both parties refuse to pay, although they could afford to,” said Mr Zainal Sapari, Chairman of the Pasir Ris-Punggol Town Council. He added that residents who refuse to discuss a payment plan with the town council may be charged “as a last resort”. When contacted, the Workers’ Party-run Aljunied-Hougang-Punggol East Town Council did not address queries on how it manages arrears and the profile of households in arrears. With the Ministry of National Development (MND) reviewing the Town Councils Act to strengthen regulatory oversight, one observer says this may signal a “fairly different” town council management regime in the future, and asks if MND would be accountable as regulator if a town council fails. SINGAPORE: The Ministry of National Development (MND) is reviewing the Town Councils Act to strengthen regulatory oversight, in order to better safeguard residents’ interest. This was announced on Thursday (Nov 20), as part of its response to media queries over the controversy surrounding the management of funds by the opposition-run Aljunied-Hougang-Punggol East Town Council. In addition to clarifying the formula used to determine the amount of government grants received by Town Councils, MND reiterated that Aljunied-Hougang-Punggol East Town Council’s (AHPETC) financial position had deteriorated rapidly, based on the town council’s own financial statements. MND said it does not know the current state of arrears for Aljunied-Hougang-Punggol East Town Council (AHPETC) because the town council had stopped submitting a report on its Service and Conservancy Charges arrears after April 2013. Under current laws, the ministry has no power to compel town councils to submit information and there are no penalties if a town council refuses to do so. The ministry said this is because the town councils are supposed to be directly accountable to their residents. Singapore Management University’s Associate Professor of Law Eugene Tan said MND’s review of the Town Councils Act may signal a “fairly different” town council management regime in the future. A review also raises the question of changes in accountability, he said. “Part of the reason for the formation of town councils in the late 1980s was to decentralise estate management. This was the whole idea of making sure that voters are careful about who they vote into office, because this is going to affect them in a fairly intimate way in terms of how their estate is being managed,” he said. “Will the new rules change that character such that MND takes on greater oversight and will that then also raise expectations among Singaporeans that town councils will be better managed and better governed?” he asked. Assoc Prof Tan also said there are questions on the extent to which MND will be empowered to take action against town councils. There are currently only three offences that attract fines – one of which is the wilful withholding of information required only by an auditor, and not the authorities, without reasonable cause. A Choa Chu Kang resident has spotted a rat as big “as a kitten” around his estate along Choa Chu Kang Ave 3 in broad daylight. The resident, who wanted to be known only as Mr Wu, snapped a photo of the rodent and posted it on Facebook, estimating it to be longer than 20 cm in length. According to Mr Wu, the rat did not exhibit any sign of fear of his presence. “I was just amazed that the rat was so big,” said Mr Wu. Rat problems are not new to Choa Chu Kang. In July, Shin Min Daily News reported that a man was bitten on the toe by a rat while he was having his breakfast at a coffeeshop in the area while in March, a resident posted photos depicting the town’s rat infestation on citizen journalism website Stomp. The Choa Chu Kang Town Council has teamed up with the National Environment Agency (NEA) to launch a two-year Rat Attack Programme to deal with the problem. Responding to queries from The New Paper, a spokesman said: “The Rat Attack Programme officially started on 1st November 2014. It includes a dedicated full-time team that will work to reduce the rodent population significantly in the first phase while in the subsequent phase, the team will continue to carry out extermination with the aim of achieving and maintaining significant reduction in rodent activity.